A rare German language variant of Cook's map of his explorations along the northwest coast of America and the northeast coast of Asia. Based upon original work by Cook's cartographer Henry Roberts. 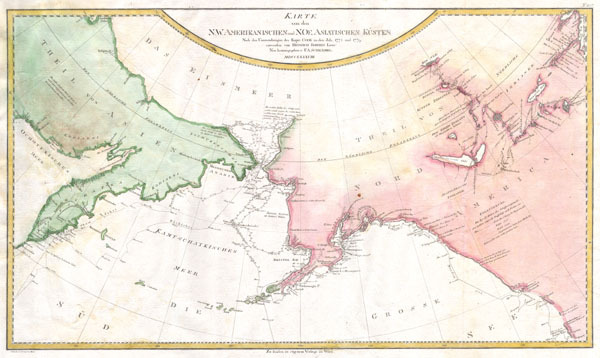 Depicts much of Siberia and Kamtschaka in Asia and, in America, shows Canada as far east as the western portions of Hudson Bay. Alaska and Asia are shown with considerable accuracy though Vancouver Island is missing. Shows several lakes west of Hudson Bay in what is today northwestern Canada. Numerous depth soundings detailed along the exploration tracks. In addition to Cook's work, also notes the explorations of Bodega and the inland discoveries of Hearn, and others. Engraved by I.C. Lackner for the 1788 edition of the Allgemeiner Grosser Atlas, plate no. 107. Franz Anton Schraembl (1751-1803) was a Vienna based cartographer working in the later part of the 18th century. Schraembl was partnered with Joseph von Reilly. His great work, the Allgemeiner Grosser Atlas was started in 1786. This ambitious atlas was to be based upon only the most up-to-date cartographic information available. Schraembl derived his maps from the work of cartographers like D'Anville and explorers such as Cook, Roberts, and others. The atlas was finally finished in 1800 but, possibly restricted by its high production cost, enjoyed only relatively minimal circulation. Very good condition. Blank on verso. Wide clean margins. Original platemark visible. Original folds. Phillips, Philip Lee, A List of Geographical Atlases in the Library of Congress, 694-50. Kershaw, Kenneth A., Early Printed Maps of Canada, 1149.